I have referenced the concept of “child-training” multiple times here on the blog (obviously, I didn’t come up with that, since it’s Biblical). I’ve even answered a lot of specific questions (here are part 1 and part 2) with things that we do in our house to point the kids toward the Lord and help them be consistent every chance we get. BUT! I’ve never actually sat down and written a post that puts our child-training philosophy and practices in a nutshell (ha…as if…more like a Christmas-sized bag of walnuts…the “nutshell” approach is not my forte). One reason? For every one of you that has specifically asked me to do this (and there have been a number over the years), there are at least as many who are thinking, “Nah, I’m good. I’ve got our routine down. Not interested.” And that’s FINE. My blog may be called M is for Mama, and I may talk a lot about motherhood, but I am in no way deluded into thinking that I’ve got this all figured out or am doing it perfectly. AT. ALL. Another reason? The internet can be a bit of a scary place filled with people who come into a blog post (sometimes without ever reading a single other post you write) with all kinds of assumptions and baggage. There’s no guarantee they’re going to read my words as I intend them or to even read them correctly. Example: a while back, I stumbled upon a message board about my blog in which a woman criticized me for my extravagance in choosing a Viking stove because she had seen a picture of one in a design board I’d thrown together and had not read the sentence immediately following the picture, which said it was just there as an example and that I would never actually pay $13,000–or anything like it–for a stove. It took me a long time to even consider the possibility that I might have anything helpful to share and to feel confident enough in my mothering to recognize that my fear of being seen as “bossy” or a “know-it-all” was just a (potentially) selfish excuse to keep from getting yelled at (virtually or not). Because people get touchy about this momming stuff, yo. But then I shared this on Instagram last night and had several young mamas ask me again about my “methods,” so I figured I would woman up and just write the post already. I hope it is helpful to at least one of you. This morning, I woke up almost sick with exhaustion after a week of house projects and Honor’s waking up multiple times every night. I lay down on the couch after I’d fed Honor and put him down for his morning nap, and before I even realized it, I’d dozed off. I woke up periodically to the sounds of the kids playing upstairs and Theo’s squawking, but all was mostly calm. After about an hour, I got up to check on them and discovered them deep in hush-hush discussion. They begged me to go get in my bed and wait for them. So, I got Theo down for a nap, then lay down again and caught up on Instagram. 15 minutes later, the twins came and “took my order” for drinks and lunch, and 15 minutes after that, all of the (awake) kids (not pictured, but awake: Honor) brought me lunch in bed. 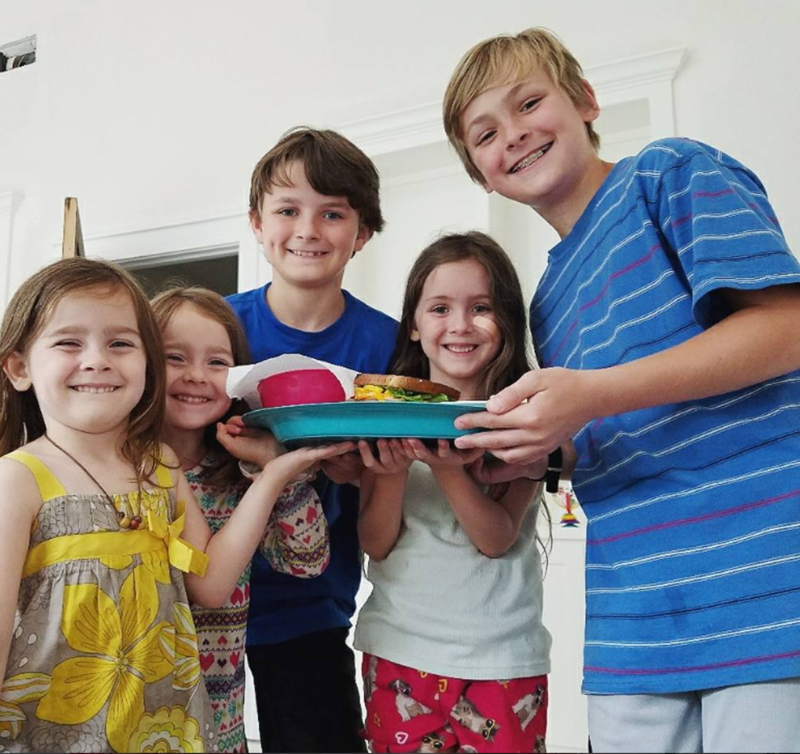 They informed me that, while I napped on the couch, they had convened a “kids’ council” in which they had discussed ways to be a blessing to me–landing on making my bed, preparing me lunch, and giving me a “mama spa” (hand and foot massage). That’s not even the best part, though. During their kids’ council, Ezra had read them all a devotional and taught them a new memory verse. Which all of them, including the twins and Theo, practiced together. You guys. This is the kind of day that brings me to my knees in tears in worship of the good God who has allowed me to be mama to these precious creatures. Only He is great, and His love endures forever! To say that I was touched by and proud of my kids’ sweet actions doesn’t even begin to describe it. And I can honestly say that, while this kind of behavior doesn’t surprise me that much now (although, it’s certainly not an everyday occurrence, and it thrills me to no end), 5 years ago, I couldn’t have even fathomed such a thing (because my oldest would have been 6, and, while they can do fun things like bring you wildflower bouquets, lunch + massages + devotionals aren’t really in their wheelhouse yet). So, the questions that I get the most are: 1) What do you do to instill a servant heart in your kids and 2) How do you get them to be self-motivated to do right? Every day, I thank the Lord for my children in their presence. They hear me tell God how grateful I am for them. And they usually hear me tell him that I need his help being patient and kind and using gentle words (pretty convicting when I stop, mid-prayer, to snap at the toddler for pile-driving me from the arm of the couch). Throughout the day, I thank the Lord for good moments, repent of bad ones, and ask for his wisdom and help. At night, I thank him again for my children when I pray in bed with my husband. Am I perfect at this? Hardly. I miss many, many opportunities to pray over my children. It is actually a very specific mothering goal of mine to get better at this. But I can tell a big difference when I’ve been slacking off in this area–if nothing else, in my attitude towards all of the little blessings who can start feeling much more like burdens when I don’t have prayer to clear my vision. There’s a reason Ezra thought to do a devotional during their “kids’ council.” We do family Bible reading (using www.oneyearbibleonline.com) pretty much every day. And we’ve been working on memory verses more faithfully for several months now. All of my kids are required to participate. Everyone but Theo has to sit still with no toys and listen. And if he can’t play quietly or mostly stay in one area, then he has to sit on my lap (which is sometimes more punishment for me than anything). I act like this is no big thing. But it, like pretty much every other aspect of child-training, is sometimes grueling, frustrating, and infuriating. Not giving up is the key. It did my mama’s heart SO much good to know that this habit is one that my kids have latched onto and that they chose to do it for themselves even when I wasn’t leading it. Their knowledge of the Bible (beyond the obvious stories like David and Goliath and Jonah and the Big Fish) has grown so much over the years, and their insight astounds me sometimes. Even when I don’t think they’re listening, they come up with some pretty deep stuff and show a really good grasp of the Gospel–both in the Old Testament and New. You know that phrase, “Practice makes perfect?” It’s not true. Perfection isn’t attainable this side of heaven. Not only that, but it matters very much what you are practicing because what you practice, you will consistently repeat. Not perfectly. But on a daily basis. So, really, practice doesn’t make perfect. Practice makes consistent. If you practice complaining and disobedience, you will consistently whine and disobey. But if you practice gratitude and diligence, they will become (something much closer to) second nature. To me, this is THEE most crucial, practical aspect aspect of child-training. You cannot.give.up. Period. It may take a week, a month, or three years (or more) for kids to get something “right,” but until they do (and even after), it is your job to remind, encourage, admonish, discipline. REPEAT. Even when you’re just too tired to do it again. Even when they don’t seem to get it yet. Even when they fall on the floor and melt down in a puddle of frustration that they still can’t get away with ____________. This one is another mothering goal of mine. Because, while I’m really good at some parts of this, I’m more lax in others, and guess which aspects of our household suffer more than others? (Yup, the ones for which I don’t have a routine). Example: all of the kids who are capable have a simple “morning routine.” For the boys, it’s an alternating cycle of sweeping/wiping down the breakfast table and morning dishes. For the girls, it’s picking up the living room. I still have to remind the little girls, but the boys treat their morning routines like breathing at this point (ha! this morning, I came downstairs after feeding the baby to find them chilling on the couch, without have made any effort to do their routines, so I guess it’s not foolproof). It just happens. It’s taken years (literally) to get it to this point of effortlessness. But it’s worth it (and how!). When your kids know what you expect of them and when, they will do it. Usually with a decent attitude (because, duh, this is my contribution right now, and is nothing to whine about). People notice my children everywhere we go, just for the sheer number of them. Often, they also notice them for their obvious joy in being around each other. The olders take care of the youngers (true of Ezra and Simon with the twins…true of the twins with Theo and Honor…and so on). They notice when they help me load the checkout belt and bag the groceries. I will almost always get a comment or two on how well-behaved my children are when we are in public. Which is great and all but a completely lost opportunity if we are only “being good” for head pats or man’s praise. So, every chance I get, I take the opportunity to 1) tell people what a blessing my kids are to me and 2) tell them how good the Lord is to us. I know it sounds like I am bragging, and I always shy away from talking about the fact that my kids are “well-behaved” or “good.” I know that I’m supposed to tell you that they are wild and out of control and “stinkers” and all that. But it’s not true. Nor do I want it to be. They are not perfect, nor am I. Not by a long shot. But the fact of the matter is that our goal is to act the same way in public as we do at home (and yes, I meant to put it in that order). There is no perfection, only progress, and the more we’re aware of why we’re doing it and for WHOM, the more progress we make. I loved this post Abbie! I think that our children are very similar in many ways. Sometimes I think that people think that I am being braggadocious or lying. I’m not. They are simply delightful. I have worked extremely hard at being the mother that they deserve and more. Down to their very souls, they are GOOD. The most important thing that I tell people when they ask about my mothering is, PRAISE the good in them. You can transform their inner voice by doing that. Are we jaded in thinking that there aren’t bad days? No way! The good days just outweigh the tough ones one million times over. Thank you for sharing everything with us, the good and the hard. Mothers are stronger together. First of all, Abbie, I LOVE this, can attest that it is true, and am sharing it on my FB page today. Thanks for responding so beautifully to your readers’ questions. Second, I took a similar photo of a surprise snack my Abby made me several years ago. She was 3 or 4 at the time and had seen her older sister serve me similarly when I was sick. Wanting in on the action, she prepared me a big bowl full of bing cherries (freshly washed) and barbecue Fritos (slightly soggy), all mixed up together. That may not sound very appetizing, but I ate every bite and praised her thoughtfulness, as I definitely wanted her to feel the extra effort was “worth it.” Those sweet considerations melt my heart, and I have to tell you, the older the children get, the more frequently they occur, so keep doing what you’re doing. Third, with reference to the reader who criticized you for buying a Viking stove (although you did no such thing), I can relate there, too. When we built our house, I was sewing linens for an upstairs guest room that would house missionary friends on furlough. I’d been drooling over a Waverly print I saw at Hancock’s, but I couldn’t bring myself to pay $25/yard for it, so I prayed that if God wanted me to have it, He’d help me find the print at a better price. And He did! I “just happened” to stop at an out-of-town garage sale on my way back to Tyler from San Antonio, and they were selling an entire bolt of that exact fabric! I got 40 yards of it for $10 — 25-cents per yard. I thought (and still think) that’s a marvelous testimony of how God concerns Himself with even the smallest details of our lives, but when I mentioned this story on my blog, one reader wrote to say she thought it was incredibly selfish of me to pray for Waverly fabric in the first place. Ha! I know God is no “genie in a bottle” (and I do not treat Him as such). But I also know that He is loving and gracious and knows how to give good gifts to His children. And that sometimes, we don’t have because we don’t ask. I love the fact that prayer is your starting point in the article above, Abbie. That’s as it should be. Prayer is my starting point, too. God always hears and answers — and, even when the answer is not what I was hoping for — He is good and has a better plan for my life than anything I could ever imagine. Ah, thanks for your lovely comment, Jennifer! You are such an encouragement to me! And that Waverly fabric. That’s amazing. God is so kind to us, even in the details and “little things.” Also, you are a better woman than I. I don’t know if I could have choked down Abby’s snack, but it sure was sweet of her (har har). I love how encouraging your words come out on paper (the web, ha!) and honestly, I FEEL your love through your words for the lord and your family! Just came across your blog this year & am loving it! Your the only blog I look for updates on. Thank you for sharing your family life and experiences. I’m a mom of 6, and enjoy reading what a blessing another mom feels of her family! Thank you for this! I have a question though-do you really read all of the one year Bible online readings for one day? And how long does it typically take? Thank you! I am a single mommy (not by choice) of a 4 & 2 year old. Both of my littles are very headstrong, and it can be very discouraging to do all the “raising” by myself. My parents help me when they can. I just want to thank you for your encouragement to not give up, and to stay consistent. Praying God’s blessings for you and your family. I can only imagine, Joselyn! Hang in there, Mama! The Lord sees your efforts! Thank you so much for sharing this. I have 3 (ages 7, 6, 2) and I feel as though I’ve been floundering as far as how to be a better guide for them. When I hear my oldest parrot my impatient tone with his siblings, I cringe with guilt. I need to work harder to be love to them. You have given me a great jumping-off point for this! Hang in there, Katie! I feel exactly the same way when I hear my kids use tones or words that I know they get from me. So convicting! Praise the Lord that he is so faithful and grace-filled to stay with us even when we goof up again! Okay, so I don’t really take my kids places where there isn’t an option of restraining the toddler. If we are in a store, and the child is younger than three, he is in a basket or a stroller, pretty much guaranteed. Now, that may not stave off the tantrum that comes when he wants to walk and can’t. I have definitely weathered plenty of trips in which I spent the entire store visit with both hands on either side of the seat portion of the cart, literally hemming in the toddler and pretty much constantly telling him, “No, you may not get out.” Definitely not my favorite at all. However. With every kid, as with all things, it’s only been a phase, and, if I am consistent in not allowing them to get down when they’re really not capable of walking/obeying (because their attention spans are all over the place), then they come fairly quickly to understand/expect that it’s not an option and stop fighting me. Did that answer you question? I did write a post about how I stretch little kids attention/cooperation if I know I’m going to be out for a while. Thank you so much for this. My daughters are 4 and 3 and I just love being encouraged from other mamas who I look up to. Some days are good, others are really hard. But your 2 phrases, motherhood is sanctifying and hard is not the same as bad have both driven me on to keep doing the best I can with each moment. Some if the things you mentioned I’ve just started incorporating into our days, so this really encouraged me to keep making the effort, because it is so worth it. I would love to see more of these kinds of posts blessings on you and your family. It’s definitely a process, Jodi! Give yourself grace! You are a GOOD mama, and God chose you for your children! This is so refreshing Abbie! I opened it cringing, wondering what I need to do differently for my 7 kidlets…and there is nothing we are doing differently! So I will keep on keepin’ on…your mantra “Hard is not the same thing as bad” has been a blessing to me. My attitude trickles down to the kids and I need to be consistent. Thank you for putting yourself out on a limb and sharing this!! You’re the best! Love this! I am a firm believer that your children NEED to hear you pray for them SEE you read your bible daily & then walk what you talk. Children do not demand perfection & an apology is generally accepted & forgiveness freely extended. Another thing that I think is so important is to be genuinely interested in your child & what they are saying. Listening with your heart goes a long way. I have 4 children pretty much all “growed ” up & they have become from my best friends. Teen years had their struggles as they try to figure out life & their own beliefs & become their own person. So keep on keeping on mothers! Keep on fighting the good fight! What wonderful advice! There are seasons in motherhood where things seem to fit together and the plan “works”, but I have also endured seasons where my young teens withdrew and did not exhibit any of those positive character traits and habits. It is in those times of excellence that my mother-hearts was full of confidence and hope. But I have accepted those times of disappointment and a sense of my failure to draw me closer to the Lord. He is truly faithful to watch over His word and see it performed and perfected in our lives. The most important thing is to remain close to our children’s hearts, be full of grace and not demand performance. By-and-by I have watched each child emerge and become the amazing people that they are now. May you continue to reap a beautiful harvest with the seeds you have so faithfully sown in your children’s lives! Thank you for your wisdom, Nadene! I haven’t gotten to the teen years yet and fully expect that I will find myself frustrated by the “tried and true” methods not working for periods of time (definitely found that true for stretches with all of my kids already). Love this, I’ll definitely be rereading this post in the future! I’m expecting my first in October. Thank you for sharing what works for your family. I especially like how you teach your children to work as unto the Lord instead of for men and to be consistent even when the results are not yet tangible. Love it! You are an inspiration to this mama of 5. Thank you for writing this- and all your posts! I’m so glad you wrote this. We are in the trenches of child training right now! Our children are five, four, two and three months. Reading about your family is such an encouragement to me! I’m so glad, Lydia! Hang in there. You are ABSOLUTELY in the trenches. The helping stage is coming. Be encouraged! I LOVE THIS. Thank you!!!!! I’m so glad you wrote this post. I’ve shied away from writing similar posts for the same reason you mentioned, but I’m glad you took this on. I echo everything you said wholeheartedly. My children were and continue to be a major blessing to me and have never ( even when they were two or teens) been a burden and I think that all has to do with the training you mentioned. Carry on. From one momma of many to another. I love getting wisdom from the “other side,” Beth.